Disclosure: I received a complementary sample in order to facilitate this post/review. Any and all thoughts are honest, my own and not swayed in any way. I recently received the Z-joyee Women's Casual Fashion Bag Soft PU Leather Backpack for review purposes. I choice the color black but it is available in other colors including red and blue. I thought it would be a cute little bag/backpack for my 11 year old daughter. My daughter is right at that age where she wants a purse and is really getting into fashion. Upon arrival, the first thing that was noticed was the smell. A very chemical, noxious overbearing smell. I cannot describe this smell but it cannot be healthy to be breathing in. I have been airing it out outside for days but the smell is still there. Disclosure: I received complementary samples in order to facilitate this post/review. Any and all thoughts are honest, my own and not swayed in any way. You can never have too many sets of bed sheets in my opinion and I have quite a few but am always willing to review another set. I recently had the chance to do just that and am glad that I did. I received the Mellanni Microfiber Bed Sheet Set in the light gray color for a queen sized bed. When this arrived, I thought the packaging was a bit typical and nothing special to be honest. However upon opening the package up and taking the sheets out, I was pleasantly surprised. They are SO soft! They are a brushed microfiber and are the softest sheets I have ever had the pleasure of sleeping on. They are oversized so they will fit deep pocketed mattresses which I appreciate because I really hate when sheets pop off at night. Summer is in full swing and it's hot out there! Nothing screams Summer more than a drink of lemonade or other refreshing beverage. My daughter and I love the ease of powdered drink mixes that we can just pour the packets into a bottle of water and drink up. However, I don't like the idea of drinking beverages with aspartame and sadly, many sugar free mixes contain it. 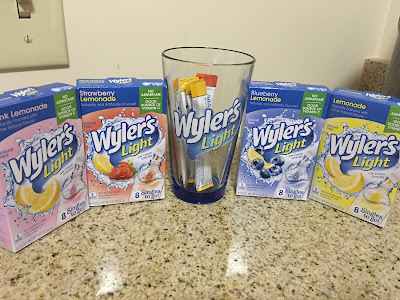 Wyler's Light offers the great tasting beverages without the sugar or aspartame! They have lots of flavors (19 to be exact) including lemonade, strawberry lemonade and even a new blueberry lemonade. My daughter owns a lot of toys and crafts so it's hard to keep all of her things organized. We have tried the huge bins but they just become a huge bin of unorganized mess. My daughter always complained she could never find anything. I recently received for review purposes a Set of 6 Light Gray Storage Basket Bins - Fabric Storage Boxes from B&C Home Goods. Upon opening the box, the bins did have a chemical smell to them but that did go away after I aired them out for a few days. Each bin is 11 inches X 10.5 inches X 10.5 inches. They are a really good size to fit a decent amount of things in but I believe they are a little smaller than some other similar bins that are on the market. I was recently sent a bottle of Anti-bacterial Body Wash with Tea Tree Oil, Argan Oil and Coconut Oil from Keeva. I was impressed with the size of the bottle upon arrival. The bottle was 28.2 ounces and large. The bottle is a pump style bottle and came with a lock/clip around part of the pump so that it did not leak during shipment. It did not leak at all. The pump is easy to use and dispense the product. The product is pretty moisturizing and left my body feeling clean. I personally liked the scent of the product as it's an argan oil type scent and smells almost like a mans cologne. If you are wanting a feminine smelling product, this really wouldn't be for you. The scent is not overpowering at all and does not really linger after you're done showering. I have had dry, frizzy, thick and coarse hair most of my life. It drives me insane! Many conditioner or conditioner type products don't really do much for my hair after it dries. I recently received a bottle of Argan Oil, Tea Tree Oil and Coconut Oil Deep Conditioner from Keeva. Upon arrival, I first noticed the size of the bottle. It's 28.2 ounces, which is a large bottle. It was shipped with a bottle clip/lock on it so that it did not leak during shipment. I love the ease of use of the pump of the bottle and the texture of the product is white and creamy. It has a pleasant scent which is not overpowering. It made my hair feel nice while lathering it into my hair in the shower. It rinsed easily without leaving any oily, greasy or residue type feeling behind. It did make my hair more manageable and less frizzy after my hair dried. One issue that drives me crazy in my closet is hangers especially hangers and pants. Some of the pants that I enjoy wearing are a slinky knit type and seemingly fall off of most hangers. It's a constant battle of trying to keep the pants on the hangers. I recently received for review purposes a set of 20 pants hangers from B&C Home Goods. They are made of strong metal, have a black rubber coating that makes them non-slip. They hold up to 20lbs as well. When I first saw these hangers, I had my doubts about how non-slip they would be. Upon arrival, the box was heavy. These are definitely not your typical light weight and flimsy hangers. I have struggled with skin issues since being a teenager. From dull looking skin to huge pores to acne, you name it. I have tried a ton of creams, cleansers etc and while my face seemed clean, it really was not. I have seen the electric brush type products around for years but never wanted to invest the money because I thought they wouldn't clean as well as they claimed especially for the money. I recently was able to receive the Elechomes Electric Facial and Body Skin Brush Cleanser to try out in exchange for a review.